With the introduction of hammock and stand combination sets in recent years, setting your hammock up indoors or using a hammock in the bedroom has never been easier. The manufacture of 9 foot long hammock stands with a hammock included make this task even more effortless due to their space saving designs. As you can see in our other blog post here, using a hammock in the bedroom is becoming more and more popular for very good reason. There are also a number of reasons why sleeping in a hammock could be more beneficial for getting a good nights sleep when compared to sleeping on a regular mattress. When looking for a hammock stand to use indoors there are a few things to consider first. The most important is obviously, how much space you have in the room you plan to use the hammock stand in? For many, a 9 ft long hammock stand will be the best option. Although 9 ft stands are generally the shortest hammock stands available do not let that put you off, especially if you are on the taller side. Despite what some people assume, there is often more than enough space to spread out and relax when using a portable 9 ft hammock stand, and in addition to this many come with double hammocks. 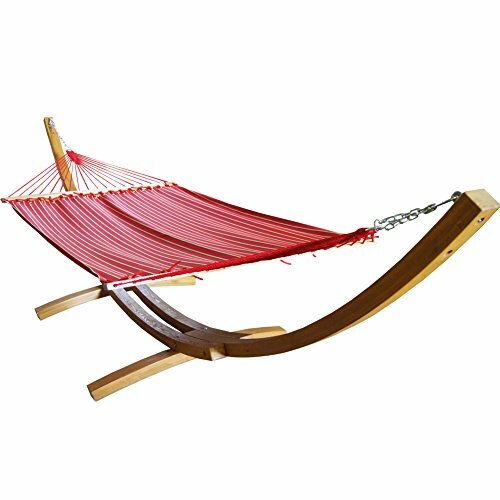 Wooden hammock stands are less suitable for use indoors, due to their bulky nature. They are also not as easy to disassemble and assemble when compared to steel stands. If space permits you could also consider a slightly longer 10 – 12 ft hammock stand or even a 15 ft stand. However, the disadvantage of this is that many of the longer stands tend to be best suited to use with spreader bar style hammocks. In most peoples opinions spreader bar hammocks are less preferable to sleep in and potentially more dangerous, especially if they are fairly slim in width. Since you are not cocooned inside of a spreader bar style hammock as much as other hammocks there is not much room for maneuver, meaning it is harder not the end up on the floor should you doze off in one. If you have a great deal of space you could also opt for using a wooden hammock stand indoors. A steel hammock stand however, is probably more preferable since they are lighter and can therefore be moved around a lot easier. They are also easier to disassemble in a matter of minutes, where as a wooden stand could take a while. Another thing to consider is, will you be moving your hammock stand around? For example in the summer are you likely to want to use the hammock stand outdoors as well as inside? This is another reason why 9 ft space saving hammock stands are excellent choices. They can be assembled and disassembled so easily and quickly that they are perfect for portability. They are so portable in fact, that many come complete with a carry bag included, in which you can hold both the hammock and stand to conveniently move everything fairly effortlessly. What are the best 9 foot hammock stands available? The space saving Vivere 9 ft hammock stand with hammock is widely considered to be one of the best available. If you want to know what the highest rated hammock and stand sets are, we would recommend you take a look at our best hammock stand guide. In particular take a look at the top 3 best 9 ft hammock and stand sets section. One of the best 9 ft hammock stand sets available is the one from Vivere, that comes complete with a double hammock and has a 450 lbs weight capacity. You can view all of the Vivere double hammock color options available with the 9 foot steel stand here. Although the Vivere 9 ft long hammock stand with double hammock isn’t the cheapest 9 ft stand set available, it is certainly considered the best choice by many buyers when it comes to quality and longevity. There are also certain Vivere hammock color options that are a lot cheaper than others, the Vivere Denim style double hammock and stand set for example (pictured right) costs a little over $100 making it exceptional value for money. If the Vivere double hammock and stand set isn’t to your liking, you can view more space saving 9 ft hammock stands here! When reading about space saving 9 ft hammock stands online and viewing the options that are available, it is not surprising to find that many who leave a review have bought the hammock and stand set as a gift for a friend or relative. Due to their affordable price tags which are usually around $100 or less, 9 ft space saving hammock and stand sets are a great choice for a gift idea. If you are looking for a gift that is a little different for a loved one, in most cases you can be sure a space saving hammock and stand set will be greatly appreciated!